In announcements made at the April RAST meeting held at Sena Place members heard that the proposed Intermediate Class amateur radio examination would likely be considered by the National Telecommunications Commission in the fourth quarter of this year. RAST had learned from a source at the NTC that the newly-selected NTC Chairman was waiting for royal permission before starting work. The source added that 3G mobile networks were likely to be the first priority of the NTC, while the intermediate class amateur radio examination paper would follow the existing format, with a Morse code examination included. The examination would be 400 baht, it was added. RAST continues to follow up on this and will keep members and others posted regarding the ongoing developments. There have been several activities conducted at the HS0AC club station at the Asian Institute of Technology, according to station manager Finn, OZ1HET. RAST thanked John, W2YR/HS0ZDJ for his donation of 500 baht following his activity in the ARRL DX CW contest at the station in February, while on March 27 K5GN, David, and his XYL paid a visit. That weekend a team comprising E21EIC - Champ, HS0ZFZ - Swen, HS0ZHG - Nathan, HS1CKC - Winit and W2YR?HS0ZDJ - John used the callsign E20AS making a total of 1,910 QSOs for a point score of 3,500,490 in the CQ WPX SSB contest. On March 30, a member of Japan's House of Councillors, Koushin Fujitani - JA4BVC vsited the club station and, on behalf of RAST, Finn took the opportunity to explain how its Japanese members were unable to obtain a Thai callsign because there was no reciprocal operating agreement between the two countries. "Mr Fujitani understood the problem and promised to try to do something about it," added Finn, who had also noted that radio amateurs from Denmark were in the same situation. In other matters, members at the April meeting heard that Kanchit, HS1JC had proposed that RAST should join the Voluntary Radio Association in drafting new amateur radio regulations to submit to the NTC and that he had been given the go-ahead to co-ordinate on this. Regarding support for the proposed car rally, ThaiBev has indicated support and RAST is awaiting an opportunity to meet with the company's OffRoad Group to discuss possible co-operation in staging this event, which is planned to end up at the Srinakarind dam in Kanchanaburi province. The RAST committee also agreed to a proposal by President Chaiyong, HS1QVD, that the old amateur radio handbook needed reprinting, along with an addendum about the intermediate class examination and Winit, HS1CKC and Kanchit, HS1JC had been assigned to coordinate on this. RAST also agreed to sponsor a table at an eyeball meeting of the Suphanburi Amateur Radio Club, HS7AS scheduled for Saturday, April 24 at Bang Pla Ma Padungwit School and several members were expected to attend this event. RAST President Chaiyong Wongwuticomjon, HS1QVD, was re-elected unopposed for another two-year term during the March annual general meeting (AGM) on Sunday March 7, while nine officers of RAST were elected by popular vote and Chaiyong appointed a further four members to serve on the RAST committee. When the head count was taken at 12.30, some 31 members were present -- not enough to constitute a quorum -- so, in accordance with RAST regulaton No. 26, those present waited one hour and an attendance recount then registered 36 members as being present. It was thus deemed that those present shall constitute a quorum. 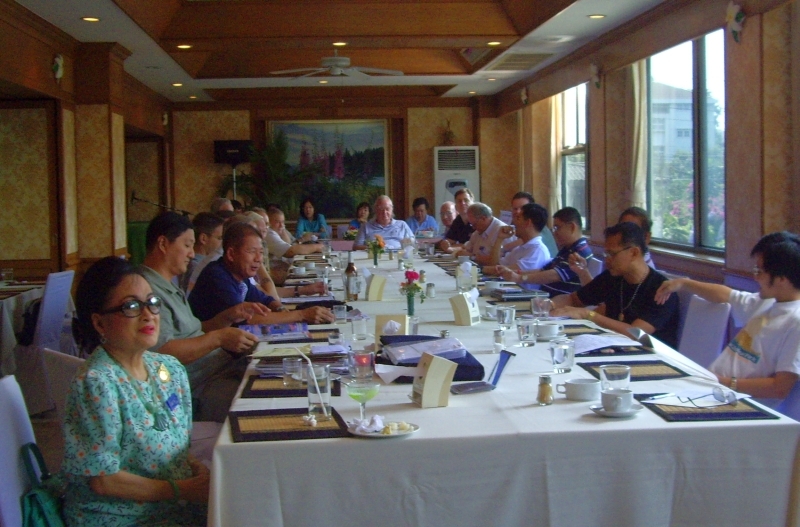 Another five committee members are to be appointed by the President for registration, after the meeting Chaiyong appointed four more members, namely Pornpimpol, HS0VDX, Kamol Nakchum, E21EHQ, and Ukrit Nooma, HS1AXC and Tony Waltham, HS0ZDX. 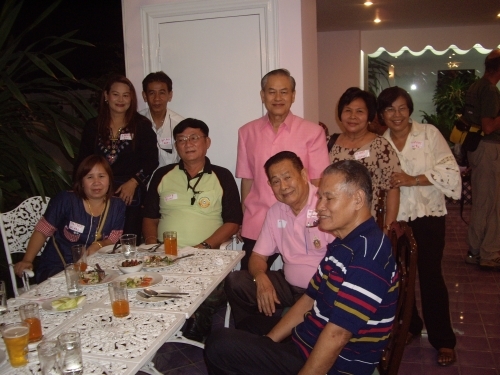 From left, Champ, Kunchit, Watcharaphon, Chaiyong, Finn, Winit, Narissara, Tempark and Phittaya with Mayuree, HS1YL, seated. Photo by HS1ASC. The meeting, the formal part having begun at 13.30, ended at 16.20. The March meeting had begun with a minute's silence after members were advised that Darragh McCluer, WA6IKS/HS0ZAG, had passed away on January 29, 2010, aged 60, after a long bout with colon cancer that extended treatment with chemotherapy had been unable to contain. Darragh had been a familiar face to many RAST members after he retired from the US military to help establish and manage Circuit Consultants (Circon), a Bangkok-based manufacturer of printed circuit boards. He had participated in many RAST activities during the 1970's, 1980's and 1990's before returning to the United States. 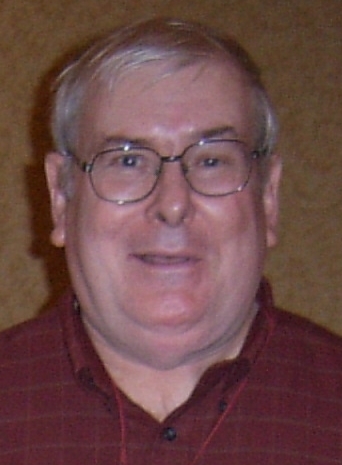 "Darragh was a resident of Thailand for many years and had a key role in the establishment of legal Amateur Radio there, and in the development of RAST club station HS0AC on the campus of the Asian Institute of Technology. After Thailand signed the reciprocal operating agreement with the USA, Darragh was one of two American hams to be publicly honored by the Director General of the Posts and Telegraphs Department, who handed Darragh his HS0ZAG license at a banquet at the Southeast Asia Net Convention. 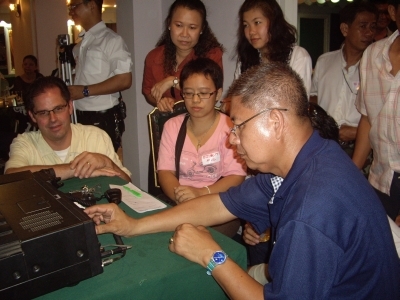 "Those of us involved through the years in the development of the Amateur Radio Service in Thailand will sorely miss our departed colleague, without whose concerted efforts Thailand might today be much more difficult to work on the HF bands." Darragh, who had been living near Atlanta, Georgia in the United States of America, is survived by his Thai wife. May he rest in peace. Before the election proceedings, Chaiyong recounted the activities of the society for the past year and also proposed Prateep Saengthammarat as auditor of RAST's finances for another year, for a fee of 7,000 baht. As there was no other contender the chairman then sought approval for Prateep to be the auditor for RAST for 2010. Chaiyong reported that, according to a survey conducted by RAST for the National Telecommunications Commission (NTC), the number of Thai novice hams interested in taking an immediate class examination is over 600 persons. He said that the examination for an intermediate class licence with a proposal to exclude a practical demonstration of Morse code capability has been sent to the NTC for approval. 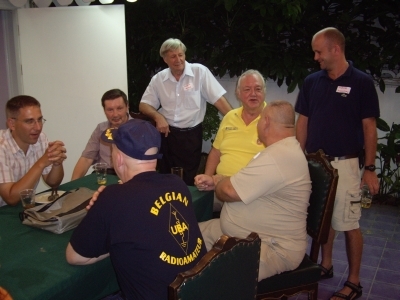 At left, IARU Region 3 Chairman Michael Owen, VK3KI, and Tony, HS0ZDX share a light moment, with Tempark, E20FWF at right, while in the right picture RAST President Chaiyong, HS1QVD, is seated next to Shizuo Endo, JE1MUI. Photos by Champ, E21EIC. During the second week of March (March 8-12) there was a meeting in Bangkok of the Asia Pacific Telecommunity Conference Preparatory Group for World Radio Conference 2012 to be held in Geneva. Attending on behalf of RAST was Maj Narissara, HS1CHB, while there were four delegates attending the procedings from the IARU Region 3, being IARU Region 3 Chairman Michael Owen, VK3KI, IARU Region 3 Secretary Jay Oka, JA1TRC, Shizuo Endo, JE1MUI and Peter Lake, ZL2AZ. 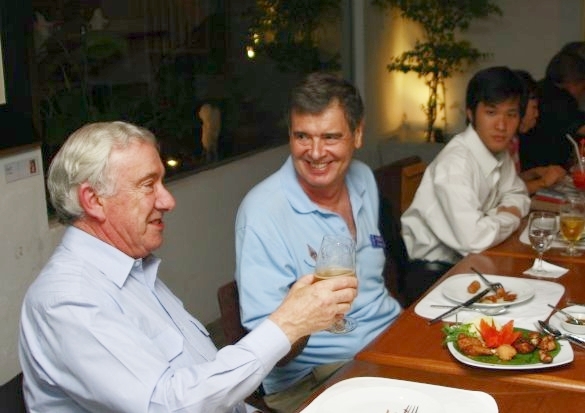 On Wednesday March 10, RAST hosted a welcome dinner for the four IARU R3 delegates, attended by RAST President and seven committee members at the "Curries and More by Baan Khanitha" restaurant on Soi Ruam Rudee. Regional and domestic amateur radio issues were discussed, including membership, the IARU R3 dues and the Wireless Institute of Australia's celebration of 100 years since its establishment this March and the special event station VK100WIA. RAST members relax after lunch during the February meeting at Sena Place. An update about developments around the proposed Intermediate Class amateur radio training and examination was probably the most significant announcement made by President Chaiyong, HS1QVD at the February 7 meeting of RAST held at Sena Place Hotel. He told the 40 or so members present that in response to the National Telecommunications Commission (NTC) enquiry asking RAST how many novice class amateurs would be interested taking the exam, RAST had learned that the number was at least 200. RAST had gathered this from responses to letters sent to 67 amateur clubs across the country and from announcements on VHF. RAST has notified the NTC accordingly. 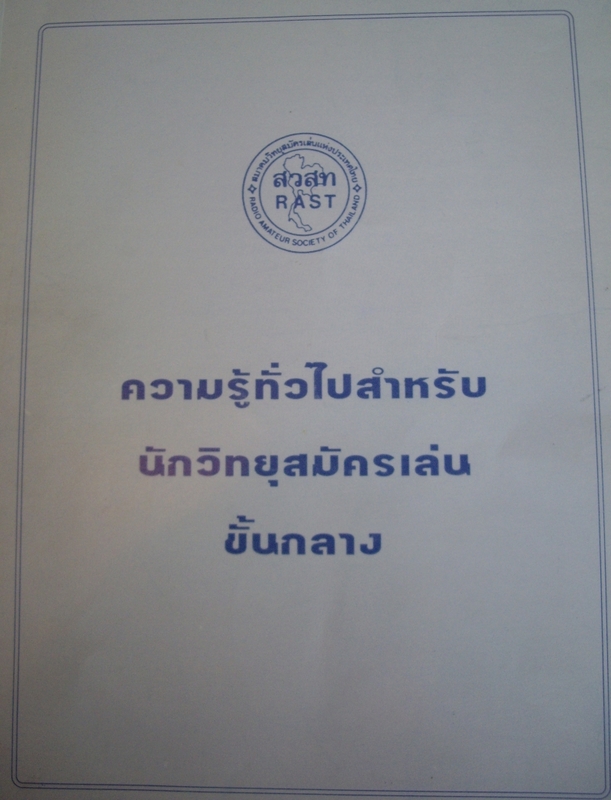 RAST also has handbooks providing "General Knowledge for Intermediate Class Amateurs" in Thai (shown at right) and will make these available (printing more copies, if necessary) as well as conducting training sessions, with at least two planned, the first some three to four weeks before the yet-to-be announced date of the examination and the second on the morning of the event. Officers Kanchit, HS1JC, Winit, HS1CKC and Narissara (John), HS1CHB, have also been assigned to look at the examination questions. It is expected that the exam will comprise 50 multiple choice questions, taken from a "bank" of 200 questions about Thai and international amateur operating laws and conventions, operating procedures and technical matters regarding operating on the HF bands. Regarding the examination itself, RAST officer Uthai, HS1RGF, will liaise with the NTC regarding the location of the Intermediate class examination. RAST is also seeking for the Morse code requirement to be waived, at least for sending and receiving Morse code since most countries have now eliminated the need for Morse code capabilities, including all of those which have a bilateral reciprocating operating agreement with Thailand. However, a written test demonstrating knowledge and understanding of Morse code to the extent of being able to write down the equivalent in dots and dashes for Q-codes or plain text is not ruled out. Other announcements included RAST's participation in a recent meeting of the Intellectual Property Department of the Government to look at IP protection for Thai products attended by Tempark, E20FWF, and a meeting organised by the Interior Ministry's security committee to discuss contingency planning for emergencies and to set up a co-ordination centre for mass communications. This had been attended by Narissara, HS1CHB. The Government's Disaster Prevention Department is seeking input from RAST on contingency planning for a disaster, having sent the society a questionnaire, which is now in the hands of Kanchit, HS1JC. It was also announced that RAST President Chaiyong had responded to an invitation, and had agreed serve as a candidate for an electoral committee that would screen candidates for the position of an NTC commissioner. 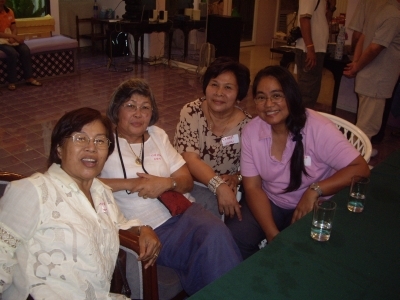 Chaiyong also told those present that he and some four to five other RAST members had attended a merit-making for Ray Gerrard, HS0ZDZ, at his Pathum Thani home in Mooban Pradhana (Klong 6) on December 18 and had found Ray to be "better", responding to his visitors and appearing to recognise them, although he had still been unable to have a conversation. Ray, a former officer of RAST, had been in a coma for three weeks following a heart attack in November 2004, and has slowly been recovering and is now taken care of by his wife, Lawan, E21UHL. Late last month, Chaiyong, HS1QVD also led several RAST members to join a large celebration at the Queen Sirikit National Convention Hall to mark the 15th anniversary of the Bangna Samphan ham radio group. RAST has also been notified of the meeting of the APT Conference Preparatory Group for WRC 2012 to be held March 8-12 and will contact the NTC regarding the possibility of having a representative participate in this, it was announced during the February meeting. In an update on the proposed car rally from Bangkok to Sri Nakharin Dam in Kanchanaburi Province, the date has yet to be fixed, but tentatively the event will be staged in April, after the Songkran break. HS0AC club station manager Finn, OZ1HET, summarising recent activities, mentioned the donation of the Kenwood TS440S tranceiver and other station equipment at the January New Year Party by Lyle Greeno, W0OMK, as well as participation in Hungarian DX contest on January 16-17 2010, when HS0AC had 120 QSOs and achieved 6,180 points under "relatively poor" conditions. On the topic of contests, Champ, E21EIC, was invited to come up and make a quick summary of the Thailand Field Day VHF Contest that had just concluded -- just some 90 minutes earlier -- the contest having been from noon to noon February 6-7. He said that there had been around 120 stations with between 350 and 400 operators participating, many of them new to contesting and full of enthusiasm. Certificates would be sponsored by 100 Watts magazine and two metre propagation had been good, with Bangkok stations having had QSOs with Chumphon and Nakhon Sri Thammarat in the South and with Maha Sarakham in the Northeast. Tony then mentioned that the February issue of CQ Magazine had a good article about VHF contesting in Thailand, written by Champ, and noted how Thailand outshone all other countries in Asia in terms of the level of activity and contest entries. The same issue in the magazine also lists this RAST web site as being among eight "Interesting ham radio web sites" worldwide. Tony also noted that the ARRL was "following in the footsteps" of RAST since the US national amateur radio society recently appointed a lady as president (Kay Craigie, N3KN). He noted that Khun Mayuree, HS1YL, had been set the precedent in her capacity as President of RAST for many years. 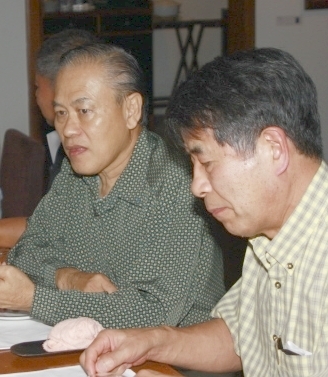 Indeed, on checking the records, Mayuree (pictured at left) had served for seven consecutive two-year terms as RAST President, from March 1992 until March 2006, when she was succeeded by Chaiyong. 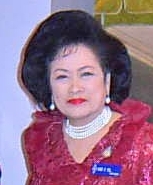 Khun Mayuree attends most RAST meetings; indeed, she was at the February meeting, and she also serves on the RAST committee in the capacity of RAST Advisory Chairwoman. President Chaiyong reminded those present that the next RAST meeting on March 7, 2010 would be an Annual General Meeting and also that this was an election year when a new president and officers would be elected, and encouraged all those present to come and vote. As of noon on Tuesday, February 2, some 62 stations and 235 operators had registered to participate in the Thailand Field Day Contest which begins this year on Saturday February 6 at noon Thailand Standard Time (GMT +7) and continues for 24 hours. Full details can be found at the official field day website, along with the contest rules. There are eight entry categories: Single Operator, QRP Portable, Single Operator, QRO Portable, Multi Operator, QRO Portable, Single Operator QRP Home Station, Single Operator, QRO Home Station, Multi Operator, QRO Home Station, Club Station, QRO and Rover. This is a VHF contest and modes cover FM, SSB, CW, MCW, Digital and Satellite, while Repeater, Echolink and VoIP QSOs are invalid. QRP means not more than 5 watts output. The contest exchange is the callsign, the signal report (RS(T)), the contest class that you are competing in and the province the station is located in. Each province counts as a multiplier. Contest rules can be found here. Our thanks go to Champ, E21EIC, for forwarding these details. 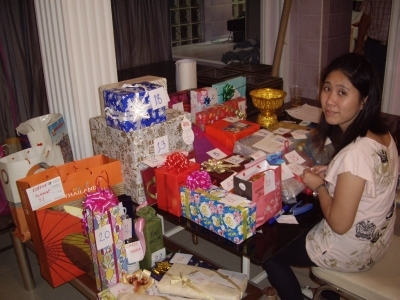 The annual New Year party on Sunday, January 10 saw a big turnout with more than 70 members and guests attending the gathering at Maj Narissara's (John, HS1CHB's) Vibhavadi Rangsit Soi 60 QTH and over 40 wrapped New Year gifts were exchanged during the evening. The party kicked off at around 3 p.m. when the first guests arrived and the numbers steadily swelled as the evening approached. 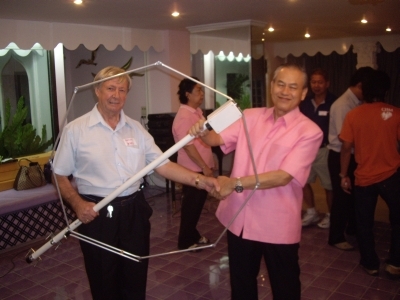 There were items on sale and some ham equipment available on a swap basis, while later on there was a raffle for a two metre loop antenna (the winner, Derek, HS0ZJH, is pictured above right with RAST President Chaiyong). The highlight of the day was the donation of a Kenwood TS440S HF transceiver (complete with power supply, microphone, SWR meter and coaxial cable) that Lyle Greeno, W4OMK/HS0ZAM, made to the society. RAST President Chaiyong Wongwuticomjon, HS1QVD, accepted the transceiver on behalf of all RAST members and HS0AC station manager Finn, OZ1HET, took custody of the equipment that will be installed at the society's club station at the Asian Institute of Technology where there is regular activity in contests, including multi-single and multi-multi operations. Prior to the donation, Sam, HS0ZDY, had checked out the rig and he verified that it was in good working order. Lyle, W4OMK/HS0ZAM, hands his TS440 over to RAST club station manager Finn, OZ1HET in a donation to RAST. Standing at left is RAST President Chaiyong, HS1QVD and at right is Lyle's XYL Orn, KC0BVH. But it was not all good news that was announced during the party, and those present learned from Gen Prasit, HS1DN, of the passing on January 6 of Kamol Choosri, HS1DG, a long-time member of RAST who had been formerly employed by the Voice of America where he oversaw the 1-megawatt transmitting site north of Bangkok near Ayutthaya. On January 11, RAST was to sponsor the funeral rites at Wat Prasi Mahathat in Laksi and many of those present at the party made donations. Gen Prasit said that RAST had sponsored a wreath on January 6 and the cremation was to take place at the temple on Tuesday, January 12. Everyone stood for one minute in silence after this announcement to mark Kamol's passing. Other announcements were brief but included word from our president that the car rally to the Sri Nakharin dam in Kanchanaburi Province was now scheduled to be staged in April, and that RAST had obtained a 30 percent discount on accommodation there from the Electricity Generating Authority of Thailand (EGAT). Chaiyong also looked back at the past year, saying it was one where RAST had worked more closely with the NTC and he said he felt that relations between the national regulator and the society had improved, adding that he hoped that this would continue to be the case through the coming year. On this positive note, Chaiyong also recalled how the NTC had authorised an additional 100 KHz in the 40-metre band last year. 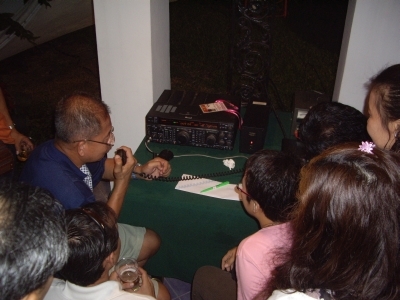 A VHF and an HF station was set up in the party area and there was much interest in operating HF, while the station also checked into SEANET (the Southeast Asia Net on 14.320) shortly after 7 p.m. There was much interest in the HF operations, including the working of some DX stations while propagation was good (SFI=84, A=0, K=0.) These photographs below capture some of the excitement and enthusiasm. A display of delicious food was unveiled before the sun went down, and which lasted the entire evening. Prasit, HS1DN, and Yanee, HS1LCC take stock. 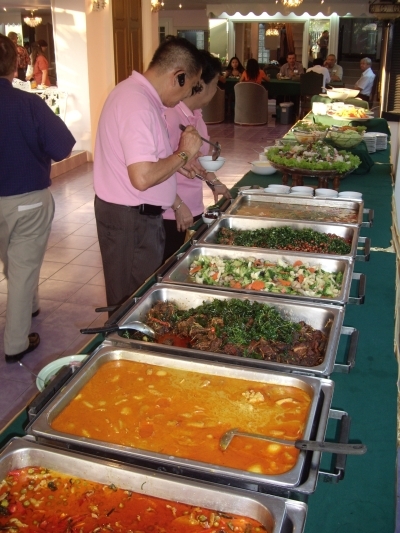 An excellent buffet spread was provided by the chefs of the Nonthaburi Palace Hotel with many delicious Thai dishes to go with steamed rice, including Panaeng, Kaeng Karee Gai, deep fried catfish, mixed vegetables, spicy sour salad, Tom Yam and a western-style salad, while there was choice of a selection of fresh fruit or pumpkin stewed in coconut milk for dessert. To wash things down there was a wide selection of sodas, while for many the highlight was two kegs of draft Chang Beer, thanks to ThaiBev which has generously supported RAST during special events such as its New Year parties and the Lampang SEANET convention in 2007 and Tony, HS0ZDX, reminded everyone during the announcement period of the brewery's support, thanking them for this. Here's wishing everyone a very Happy New Year 2010. The next meeting will be on Sunday, February 7 at Sena Place Hotel at 11 a.m.